"When will my guitar be updated to the latest Effects??" Well now you don't have to wait! The EFX Addon is an invisble "add-on" that you wear (in addition to your guitar) which gives your guitar or bass all of the latest pyros, lasers, and particle EFX without having to actually upgrade or modify the guitar. The EFX addon has to be worn on the SAME attach position as your guitar. This is how to get both things attached to the same place. Wear your guitar (or bass). Note the attach position. Depending on which HUD you are using, you will likely be wearing it either on the chest or left upper arm. Find the EFX addon in your inventory. Its a good idea to make multiple copies in inventory so you can have one position-tweaked for each guitar you will be using it with. 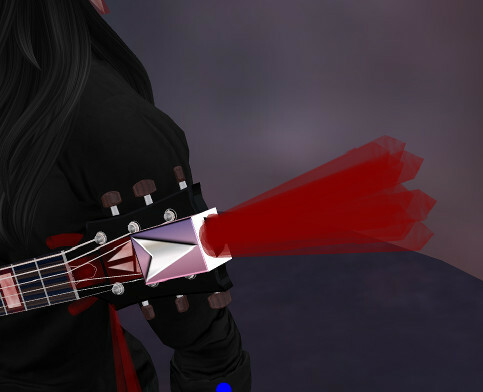 Choose the correct AddOn: Chest or left upper arm depending on what animation hud you are using and where you have your guitar attached. Choosing the right AddOn will make adjusting a lot easier. Right click the EFX Add-on in inventory, select Attach.. then attach it to the same place your guitar is. After you have attached the EFX Add-on once, it will remember its attach point, next time you can just right click it and "add". In open chat type /5566 show a purple arrow box will appear in the vicinity of the guitar headstock. that box is part of the EFX Add-on object. Right click that and adjust it to align with the headstock of the guitar. you can also do Ctrl-Alt-T to view invisible objects and see a bit better what is going on. Often times setting the edit mode to "Local" makes it easier to line things up. /5566 snap Will "snap" the Addon "close" to in position. You may still have to adjust a bit, but the snap does 80% of the work for you. NOTE: Snap does not work on the older (bargain bin) guitars, but if you start with the correct addon (left upper arm or chest) it will be pretty close already. Again, if you are using multiple guitars or basses, make copies of the EFX Add-on so you can pre-adjust one for each guitar, that way you are not adjusting during a show. Wear the HUD on any HUD attach position. Laser Control Controls the headstock lasers. Colors and movements. Experiment! 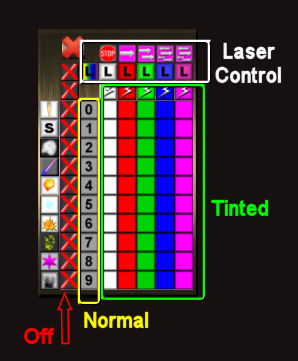 Normal These gray buttons trigger the particle EFX "untinted" the EFX will appear in their original un-altered color. Off Turns off the effect. (Coming soon) The EFX Add-on is compatible with the particle custom shop. This means that you can program your own particles, and choose from libraries of EFX. The EFX Add-on is MOD, this makes it easy to have multiple renamed copies. It also allows you to "reset scripts". If you accidently reset the scripts in the EFX Add-on the particles will stop working. There are a couple of ways to repair this. Attach the EFX Add-on to your body normally, rez the Teach Defaults box on the ground, then touch it. The Add-on will be reset to all default particles. Q: Does the add-on work with non-OD guitars? A: Yes, just remember to attach it to the same body attach point as the guitar. The "snap" feature will not work so you have to adjust it 100% by hand. Q: Will it help me get chicks?